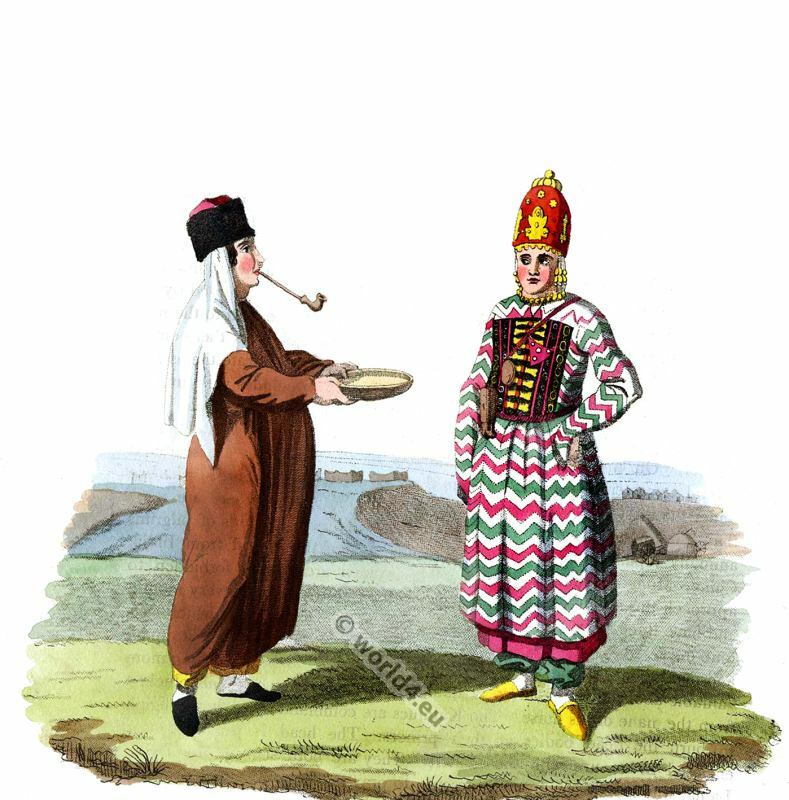 Costume of Kalmyk Housewife and Girl. Home » Costume of Kalmyk Housewife and Girl. A Kalmyk Housewife and Girl. Une Femme et Fille Calmouque. THE dress of the Kalmyk women differs little from that of the men. Their trowsers are the same; the outer garment is longer, the sleeves narrower, and the materials of which it is made finer and lighter. Both married and single bestow great pains in embroidering their bonnets. They wear earings, and paint their cheeks with rouge, introduced into their country by foreign merchants. The father possesses an absolute power over his children; he can either sell them, or give them away, and can dispose of them in marriage according to his pleasure: but, before the marriage takes place, he is obligated to send for the priest. Upon his arrival, he inquires the name of the bride and bridegroom, with the day and year of their birth; he then consults the Soudar, or book of destiny. If the priest declares that the celestial powers are unfriendly to the match, it is immediately broken off; but, when his consent is obtained, they immediately proceed to agree upon the kalym. The bride brings her husband a dowry, which generally consists of a new tent, some cattle, and a few slaves of both sexes. The marriage is celebrated by the priest at the period of the new moon. He administers the oath to the married pair, before their household divinities; he then conducts them out of the tent, he commands them to look at the sun, and to prostrate themselves on the ground; he then reads several prayers, and concludes with uniting their hands. The religion of the Kalmyks is the worship of Lama. The Dalai-Lama, or high-priest, resides in Tibet, upon Mount Pontola, near Tonker. On the summit and at the foot of this mountain are scattered several monasteries, peopled by more than twenty thousand monks, who live under the most austere regulations. In their chief temple there are more than seven hundred idols, or attributes of the divinity. Crouds of pilgrims annually repair to this spot, bringing offerings to the pontiff from India, China, Mongolia, and Kalmakia. The women arc strictly forbidden to approach this sacred asylum. The Kalmyks fast three (lays every month, and have three solemn festivals in the course of the year, each of which lasts four days. A Kalmyk never passes a tsatsa, or temple without stopping and making an offering to the idols. If he happens to have nothing more valuable about him, he leaves behind him an arrow, or some hair plucked from the mane of his horse. The Kalmyks are commanded by their religion to burn the dead bodies of their princes. The head is preserved and enclosed in an urn with the cinders. They are both sent to the Delai-Lama, who is induced, by rich presents, to pray for the soul of the deceased. This entry was posted in 1803, 19th Century, Asia, Russia and tagged Edward Harding, Russian national costumes on 11/3/14 by world4.